As entomologist Craig Gibbs notes in a recent New York Times Op-Ed, the cicadas are coming. There’s been a lot of buzz (no pun intended, I swear!) about the emergence of the Brood II cicadas, predicted to occur some time this month, as soon as the soil is warm enough. Periodical cicadas emerge every 13 (in the south) or 17 (further north) years, but because there are several different broods that are offset from one another in time, there is a cicada emergence somewhere in the U.S. almost every year (but in these are those of Brood II only cicadas that are widely present in New York City, which is probably why we’re hearing so much about them this year). May 1996 was the last time the Brood II cicadas were above the ground. “Always Be My Baby” by Mariah Carey topped the Billboard chart, and Bill Clinton was the U.S. president. As an interesting side note, May 1996 also saw the ill-fated Mt. Everest summit attempt described by Jon Krakauer in his book Into Thin Air. Me? I was finishing up the 6th grade. What’s the big deal about these insects, anyway? First, emerging cicadas apparently present a pretty striking auditory experience, with the volume of the males’ call compared to that of a subway train. In addition, their genus name, Magicicada, seems to be a portmanteau right out of the world of Pokemon. There’s also some pretty cool ecology to these critters. You may have noticed that the life cycle lengths of periodical cicadas are prime numbers (13 and 17 years). Researchers suggest that this may keep cicada emergence from lining up with periodicities in predator life cycles. In fact, a 2011 study suggests that birds that eat cicadas are actually significantly less abundant during cicada emergence years. The huge numbers of cicadas that emerge from the ground allow them to effectively swamp the predators, ensuring that at least some of the insects survive predation to lay eggs for the next cycle of cicadas. 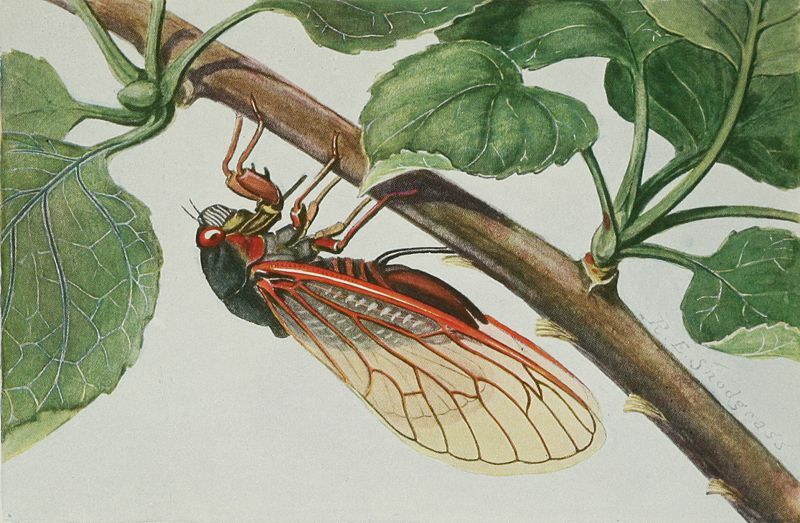 Cicadas feed on sap that they eat from the roots of trees during their long time as larvae underground. Then, the nutrients and biomass they slowly accumulate are quickly moved to ecosystems above, making these insects important connections between above- and belowground systems. The periodic burst of cicadas eaten by all sorts of animals, including birds (above), bats and coyotes, and those that aren’t eaten alive provide pulses of resources to forest soils, plants, and stream ecosystems. David Attenborough’s Life in the Undergrowth includes a great piece on periodical cicadas, and demonstrates how to play mind games with them. So, residents of the mid-Atlantic, prepare yourselves, and participate in citizen science by reporting the emergence! They have kits that monitor soil temperature, so you can predict the cicada emergence, and see data from other places in the mid-Atlantic.